King Records began streaming a "Fafner EXODUS Continuation Announcement" promotional video on Saturday. The video notes that more details about the continuation will be announced at the "Special Event -Itami-" (Pain) that the staff will host on May 24. XEBEC zwei had said in 2013 that the sequel will be a 26-episode television series. However, in November 2014 the official website for the series had listed six Blu-ray Disc/DVD volumes with 13 episodes on them. The 13th episode aired on Thursday. The fourth season of Teekyū premiered on Tuesday along with an announcement that a fifth season has been greenlit. Kana Hanazawa, the voice of Marimo Bandō in the anime, will perform the fifth season's theme song Qunka!, which will ship on CD on May 27. The spinoff series Takamiya Nasuno Desu! (I am Nasuno Takamiya) also premiered on Tuesday. The animation production studio for this and the fourth season of Teekyū switched from MAPPA to Millepensee. Piyo and Roots launched the original Teekyū manga in Comic Earth Star in early 2012, and the first anime season was announced just months later on the manga's first book volume. Earth Star Entertainment claims that this is the fastest television anime adaptation ever. A second and third season followed, with Crunchyroll streaming both series as they aired in Japan. The Cannon Busters animation project updated its Kickstarter page on Monday and confirmed that Japanese animation studio Satelight (Macross Frontier, Log Horizon, Basquash!) has begun production. The project is an animated adaptation of LeSean Thomas' Cannon Busters comic book series. The official website for Gundam Build Fighters Try added that it will start serializing a "Hobby Hobby Imaging Builders" column about Gundam plastic models in late April. Oh, just saw this, awesome news. Thanks for the post! DONT Know If This Will be Summer ( in theaters 6 / or A TBA ) Just puting it up ! 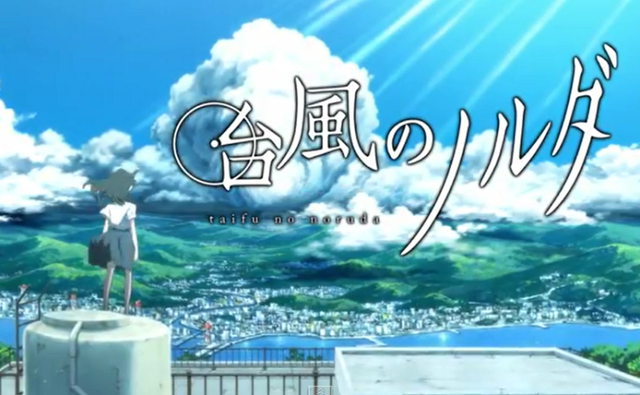 Studio Colorido announced during the broadcast of the anime Punch Line on Friday that it will animate a new feature-length film titled Taifu no Naruda (Typhoon Noruda). The film will open in theaters in Japan for a three week limited engagement beginning on June 5. Former Ghibli animator Yōjirō Arai will make his directorial debut on the film, though he has served as animation director on short anime for Studio Colorido. Hiroyasu Ishida, who previously directed award-winning shorts such as "Fumiko's Confession" and "rain town," is designing the characters and serving as animation director. Masashi Hamauzu (Good Luck Girl!) is composing the music. The film takes place on a certain isolated island, at a certain middle school, on the eve of the culture festival. A boy quits baseball after playing his whole life, and has a fight with his best friend. Then they suddenly meet a mysterious, red-eyed girl named Noruda, and a huge typhoon hits the middle school. Game developer Level-5 unveiled The Snack World — its next cross-media project after Inazuma Eleven, Little Battlers eXperience, and Yo-kai Watch — during its "Level-5 Vision 2015 -The Beginning-" presentation on Tuesday. The "hyper casual fantasy" project will feature a Nintendo 3DS/Android/iOS game by Level-5, a full-CG television animation airing on TV Tokyo, a manga series running in Shogakukan's Monthly Corocoro Comic magazine, a toy line from Takara Tomy, and a movie that TOHO will distribute throughout Japan. During its presentation, Level-5 streamed a CG pilot film in which the main lead Chup and his companions "embark on a great adventure!" The story is set in Snack World, a seemingly traditional fantasy world — except it has smartphones and other elements of the modern world. Dynamic Planning announced via a press release on Thursday that a new Devilman anime based on Go Nagai's classic horror action manga will launch this fall via an event screening. Animation studio Actas (Girls und Panzer, Kotetsushin Jeeg) will produce the anime. Additionally, Dynamic Planning will release the below visual for the anime in seven theaters across Japan starting on April 18. The staff of the selector franchise announced on Sunday at a fan event for the franchise that production on a new film has been green-lit. We announced this at the event a few moments ago, but production on a selector film has been green-lit! selector isn't ending yet! selector will be in your hands from here on out as well. Warner Bros. is also streaming an announcement trailer for the film. The trailer shows highlights from both Selector Infected Wixoss and Selector Spread Wixoss before showing the following text: "And now a film version has been decided." The toy and game maker Takara Tomy launched the WIXOSS (pronounced like "wi-cross") card game last April. The Selector Infected Wixoss anime series also premiered last April, followed by a second season, Selector Spread Wixoss, in October. North American anime distributor FUNimation Entertainment streamed both seasons as they aired in Japan. POSTED HERE and I wiil put on my SPRING / Summer personal watchlists?? Japanese publisher Kodansha's official YouTube channel began streaming a promotional video for the anime adaptation of Kentarō Okamoto's Sanzoku Diary manga on Sunday. The video reveals the anime's cast and staff, and previews the show's theme song "Usobuku Sanzoku" (Boastful Bandit). Kentarō: December 31, 2009. Snow. Text: Kentarō Okamoto, Occupation: Hunter, occasional manga creator. Kentarō: I, Kentarō Okamoto, hunt deep in the mountains of Okayama Prefecture. Kentarō: Distance is about 40 meters. If only it'd face a little more this way. Text: Collects hunting and gourmet scenes from the first manga volume. Text: Studio DLE mixes CG for a flavorful production. Text: You'll go hungry when you watch it, but your heart will be fulfilled. Azuma Tani (Thermae Romae, Haiyoru! Nyaru-Ani, Japan Animator Expo's "Hill Climb Girl") will direct the project at the studio DLE. Romanov Higa (TANK S.W.A.T. 01, The Future Diary 3D CG) will serve as CG director. Kodansha will bundle the anime with a special edition of the manga's sixth volume, which will ship on June 23. The manga will also come with an original table coaster. The manga follows the real-life story of how Okamoto became a hunter with his air gun and ate what he hunted, including deep-frying (karaage) a rabbit, roasting a duck, and grilling (yakitori) a crow. The manga also includes survival techniques as Okamoto relates when he himself became lost in the mountains. Okamoto launched the manga in Kodansha's Evening magazine in 2011. The manga was nominated for the 6th Manga Taisho Award and the 38th Annual Kodansha Manga Awards in 2014. The staff of the first new Lupin III television anime series in three decades announced on Tuesday that the series will premiere this fall on the Nihon TV channel and other broadcasters. Franchise veteran Yuji Ohno's involvement as composer was also announced. Ohno commented on his involvement, saying, "Lupin is returning center stage! This is what 'Lupin Sound' should be! Please look forward to that kind of music." Franchise veteran Kazuhide Tomonaga (key animator on Lupin the 3rd: The Mystery of Mamo and Lupin III: The Castle of Cagliostro, particularly the whole iconic car chase) is serving as chief director, and Yuichiro Yano (Moyashimon, Francesca, Mujin Wakusei Survive, Patapata Hikōsen no Bōken) is directing at Telecom Animation Film. Writer Yuuya Takahashi (Donten ni Warau, Tiger & Bunny, Lupin the IIIrd: Jigen Daisuke no Bohyō) is in charge of the series scripts. Tomonaga noted that the Lupin III anime that his generation watched four decades ago was completely different from the previous anime aimed at children. He added that it had a very huge impact on the diehard adult fanbase. For the generation that already experienced that amazement as well as the generation unaware of those days, Tomonaga wants to make an exciting animation that is realistic yet sprinkled with fantastic elements. Furthermore, he wants to depict a Lupin in which conflicting elements coexist — hard-boiled yet comical, cool yet tongue-in-cheek. STARTING 5/20/2015 6 Monthly Episodes! young girls with enormous destructive power, has finally got a Japanese release date. After the first season aired early in 2014, we were given the news in December 2014 that there would be a sequel season for Toei’s Robot Girls Z. It was set for a spring 2015 debut under the title of Robot Girls Z+. Most of the spring season has come and gone and little has been said about the show in general. Now news has come that the series is going to begin its run on May 20th, 2015 on Niconico and YouTube, similar to the first series. Crunchyroll did stream the first series, but after it was largely done and with the episodes combined into larger chunks. The plan is for one episode per month to be released for six episodes total that run about eight minutes each. Suffice to say, there’s a long window for this series. The series takes characters from Toei and Dynamic Planning and changes the various giant robots into cute girls for wacky and silly adventures that will delight many and infuriate others. It’ll be directed by Hiroshi Ikehata based on scripts by Kazuho Hyodo with Tetsuya Kawakami doing the character designs at Toei Animation. It stars Kazusa Aranami as Grenda-san, Inori Minase as Gre-chan, Mariko Honda as Z-chan, Sayuri Yahagi as Liga-sama, Maaya Uchida as Gecchan Dragon, Misaki Kuno as Pon-chan, Minami Tsuda as Jeeg-san, Natsumi Koike as Paan-san, Emi Nitta as Raicchi, Kaori Takaoka as Triple Gai-chan, Naomi Ozora as Bal-chan, Emi Hirayama as Shoo-chan, Shiori Mikami as Go-chan, Ari Ozawa as Gai no Jo and Ayana Taketatsu as Bossborokko. Plot concept: Robot Girls Z centers around three girls based on Toei’s famed Mazinger Z franchise: Mazinger Z, Great Mazinger, and UFO Robot Grendizer. The girls go around Tokyo raising awareness about the promising new energy source “Photon Power.” However, when the enemy Mechanical Beast girls appear and attempt to steal the energy, the girls, collectively called “Team Z”, must battle them in order to prevent the Photon Power from being stolen! AH I was editing my post at the same time but thank you very much! I like this show too kinda like Excel Saga !